Funny Weird Creepy Squeaking Animated Wild Bump and Go Rat Toy Prop Decoration. 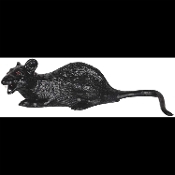 This spooky large life size scary black rat is sure to get a rise out of your friends. Not only does it squeak, it will zig zag across the floor with any loud noise. Vinyl rat with crazy bump and go mechanism built right in. When noise activates him, this scary rat moves quickly and when it bumps into something it turns and goes the other way. Recommended for uncarpeted floors for best results. On-Off switch. Sound activated. Requires 3-AA batteries (NOT included). Approx 7-inch long without tail x 4-inch wide (17.5x10cm).